Caledonian Marts Ltd sold 2031 prime lambs, ewes and tups on Tuesday. A large show of heavy well fleshed lambs were forward, which resulted in more than 50 per cent of the sale weighing 46kg+. Lambs between 39-44kg were very keenly bid and many more could have been sold to sellers’ advantage, averaging out at 175p (+7p on the week). Overall sale average for 1544 sold was 162.4p (+1.8p on the week). Top price of the day went to A McLaren & Co, Nether Strathkinnes, St Andrews at £97 for a 57kg Texel. 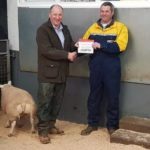 Top price per kg went to F Cook & Sons, The Moor, Isle of Arran for a cracking 43.5kg Texel at 205ppkg. Lamb prices per head: Beltex X £96 West Lundie, Beltex £96 Cuiltburn, Cont £95 Meikle Seggie, Cont X £95 & £94 Doune Farms, Texel £90 Victoria, Texel X £88 Dechmont, Suffolk £82 Nether Strathkinnes, Mule £71 Kilspindie, BF £71 West Lundie. Lamb prices per Kg: Beltex 203p & 200p Meikle Seggie, Beltex X 202p Dowally, Cont 200p Braco Castle, Cont X 200p Cultburn (Stepps), Texel 198p Greencraig, Texel X 197p Braco Castle, Suffolk 164p Kilspindie, Mule 161p West Lundie, BF 161p West Lundie. Also forward were 497 cast ewes, feeding ewes and tups. A large show of feeding BF’s forward resulted in the average being back. Ewes sold to £80 for a Texel from R Orr, Heights, Buchlyvie. Other leading prices: Texel: £76 Cassindonald, £73 Bankhead, £70 Braco Castle & Nether Cambushinnie. Suffolk: £80 Kinnaird. BF: £38 Hilton of Aldie, £35 Braco Castle & Tamsacre, £34 Bankhead & West Kelt. Cross: £74 Nether Cambushinnie, £64 Loig. Mule: £58 Kinnaird, £54 Nether Cambushinnie, £52 Bankhead.